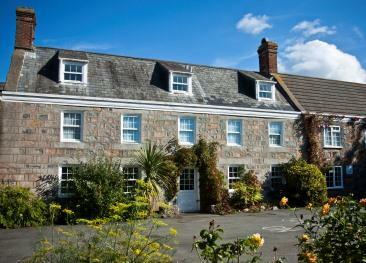 The Cobo Bay is a fantastic beachfront hotel in a fabulous location, facing the ocean on the west coast of Guernsey. The hotel features an award winning restaurant and stunning views over the sea and beach opposite. 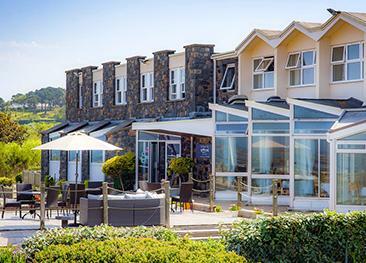 The Cobo Bay is a fantastic beachfront hotel in a fabulous location, facing the ocean on the west coast of Guernsey. The hotel was purpose-built in 1964 and has been family-run ever since. The service at the Cobo Bay is always personable and pleasant. Each summer the hotel hosts a number of music events with tribute bands playing from the balcony of the hotel. The road in front of the hotel is closed for these events and there may be some disruption for guests. 2019 events take place on 5th May, 26th May, 30th June, 14th July, 4th August and 25th August. There is a selection of single, double, twin or family Standard and Superior rooms. The 12 seaview and balcony rooms are always in high demand so don’t hesitate to request them when booking. It might be too late to upgrade upon arrival. Extra beds and cots can be placed in any of the double / twin rooms, standard as well as superior. All rooms are en-suite and equipped with fluffy bathrobes and slippers, fan, complimentary water on arrival, plasma TV with freeview channels, safe, tea & coffee facilities, complimentary eco-friendly toiletries, telephone, free WiFi, ironing facilities, hair dryer, and room service until 10pm. Open for breakfast, lunch and dinner, the Cobo Bay restaurant, which has a gold award from Taste Guernsey, faces the beautiful bay and serves delicious local produce including freshly caught seafood. The menu offers a varied range of dishes from casual to more sophisticated options. The terrace is the al-fresco extension to the restaurant room, offering spectacular views and a comfortable place to relax and enjoy anything from a meal to a drink, from 10am until 10pm. The in-house health suite comprises a sauna, a small steam room and gym equipment. Guests have complimentary access to the outdoor heated swimming pool at sister hotel The Farmhouse, located in the country parish of St Saviour. Use of the pool is subject to availability. The Cobo Bay is disabled-friendly with some wheelchair accessible rooms and a lift serving all floors. Disabled parking is in front of the hotel. Very nice hotel. Good service from all the staff. Downside was nowhere to sit and have a read after a long day. Sun terrace exposed with no sun protection. Lovely friendly hotel with helpful staff and the most comfortable beds I have ever slept in. An hotel on the beach...great location, fabulous food, v. professional staff, especially at reception & dining room, lovely people. Just the right choice for a Golden Wedding Anniversary celebration! Oh, & check out the sunset! Good service. Great views from the sea facing rooms and restaurant. Good sized, comfortable room. The breakfast was uninspiring, evening meal rather expensive but ok. Pleasant staff. Room in hotel was great as we had upgraded to a front balcony room so very spacious and views were perfect, great sunsets. Food excellent. Staff very friendly. The Hotel was a great choice for its views and excellent food. The awards it has won for its food are well deserved. A really nice hotel, staff and cuisine, booked a sea view room and was not disappointed. Would definitely go again and would also recommend to family and friends which normally I would not due to peoples tastes being so different. The Hougue du Pommier Hotel is an original 17th century farmhouse that sits within eight acres of landscaped gardens and private land. The hotel features an outdoor heated swimming pool and a popular restaurant. 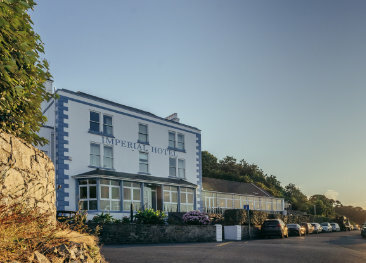 The Imperial Hotel is situated on Guernsey's south-west corner, surrounded by sandy beaches, blue seas and extensive cliffpath walks. The Driftwood Inn is situated on the beautiful rural west coast of Guernsey, a short walk from the beautiful sandy beaches of L'Eree Bay and Vazon Bay. Copyright © 2014 - C. I. Travel Group Ltd.